Last-Gen Heroes: Atlus is no "Square"
The Last Generation of gaming saw me log more hours into my DS and PSP than on my Wii and Playstation 3. On the go gaming just made more sense with busy weekends, and a two hour commute each day for five days a week. The ten or so JRPGs I bought for my PS3 and Wii for the most part remain untouched. Of the handful I played, Final Fantasy XIII and Eternal Sonata disappointed me while Costume Quest brought Halloween to life, and the joy of inedible candy into my heart. While I have some gems waiting to be played on my consoles, I needed to not look very far to get my JRPG fix as both the DS and PSP were willing to cater to those needs. Square had a strong presence in that regard but when thinking about the Last Generation of gaming for JRPGs and SRPGs, it's clear that there's one company in particular that has become a force to be reckoned with. For all that Square failed to provide me in terms of console gaming for the previous generation; the same cannot be said for what I received on the portables. Bringing entries of the Dragon Quest series to the DS was much appreciated. The older titles were new to me, with Dragon Quest V being one of the most intriguing, messed up games in terms of story I’ve had the good fortune of playing. Dragon Quest IX tugged at my heart strings in its individual tales while playing with my emotions at the end. The Kingdom Hearts series had some lukewarm entries but it also had a great one in Birth by Sleep. The World Ends With You, Crisis Core, Final Fantasy: The Four Heroes of Light and the amazing Tactics Ogre: Let us Cling Together all made appearances. A few of these are some of the best games to ever grace my library. Yet for some reason it’s sometimes easy for me to 'forget' all that Square has done. Perhaps that's due to the fact that I have a shoddy memory - a very plausible possibility! But perhaps too it's that there’s one constant in a name that always seems to surface whenever I think about gripping and exciting content in my recent forays into JRPGs and SRPGs. That name being Atlus. Through positive reviews of a couple of games, buzz and word of mouth I found Atlus. While I did start a play through of FES on the PS2, it was not until I replayed Persona 3 to completion on the PSP, and Shin Megami Tensei: Devil Survivor on the DS, that Atlus captured my interest in a big way. Persona 3 seemed simplistic in theory: playing the role of a mostly ordinary high school student in Japan and fighting demons. However, it was that deceptively very basic mechanic that appealed to my interest and obsession with anime and Japanese culture. The games of course, are so much more than that. They are a slice of life presentation that gets injected with style, and features darker, adult themes while tapping into the realm of folklore and the supernatural. Entering into secret, alternate realities of their own world late at night in Persona 3 or while fighting for survival during the end times of an Apocalypse between angels and demons in Devil Survivor … there was no "fantasy" setting on the surface but what hid beneath was always a mystery to solve or a reflection of the insanity in the human mind. The ‘mysteries’ laid the groundwork for the larger picture: which was the journey that forced your characters to question their own morals, tested their faith and revealed human nature to err on the side of darkness while confronting personal truths and the resolve to strive for what was ‘right’. It's the underlying journeys of each of the characters that the games present so well. Specifically for Persona 3 and subsequently Persona 4 - the idea to take ordinary characters that awaken their true personalities hidden behind masks of what is socially acceptable; and then have these characters confront their fears and acknowledge their real intentions, however dark and selfish they may be - crafted stories built around strong characterizations that are easy to relate to. Persona 3 and Devil Survivor were stories dressed up as nightmares fueled by the terrible nature of humans and the underhanded things humans are capable of (even albeit brought on by greater forces at play). The games were also nightmares in storytelling in which the unexplained quickly turned to an urban legend or depicted doomsday scenarios. The modern settings and sensibilities for ‘real’ world mysteries is a deviation from Square’s fantasy worlds filled with wonder and beauty. Atlus instead gave us halls of a high school, a schedule to follow, after school activities to participate in and friendships to progress almost naturally - and of my choosing. The benefits for maintaining and progressing relationships were all up to me. If I liked a person, then I could further their personal story and get to know them better. The incentive would be having a stronger person in combat but I could leave them to their own devices and if I did not care enough then I could forever leave bonus aspects of their personalities and their relationships with me (the main character) locked. In comparison, Square set up my friendships to follow the story closely. Whether I liked or disliked my comrade in Hope from Final Fantasy XIII, for example - that’s not the point. His story would be told and I had to experience it. It’s all part of the narrative and one that works for any game or book. Atlus also had a central story to follow with set stories for each of its characters to progress the larger narrative. But with Atlus it could feel as though I was playing the main character as a blank slate. It’s not by any means a new mechanic, and very much operates like a dating sim. This is where the bonus side stories were prevalent to get to know the people in your school, members of your party and become friends. It was unnecessary if only to unlock higher-leveled demons but it also furthered your own character development. It's that feeling of control that Atlus does well: the feeling that I am this person and I can build these relationships on my own terms. This S-Link (relationship building mechanic) in Persona 3 and enhanced and developed to be even more in depth in Persona 4, provided an interesting way to bond with your party members. Additionally, each character was given complex, real world situations and/or insecurities that anyone could relate to and thus making interpersonal relationships more believable. Taking these ideas of grounding characters in believable, social interactions and adding wrenches into what is considered acceptable for social norms was taken a step further in Catherine. In the 2011 game, Atlus made a very real connection to players by tapping into a story of morals and questioning human’s lustful desires to be traded for safety in an ordinary life and relationship. Atlus seems unafraid of going in a direction that is dark in tone. They’re unafraid of delving scarily close to the portrayals of religious cults roaming the streets of Tokyo as with Devil Survivor heralding the End of Days and the often erratic behaviour that could follow. They create murder mysteries that enter into the minds of serial killers or playing into humans' irrational fears. The games can often visually appear and feel gritty with great characterizations of each of its players while still injecting just the right amount of impeccable comedic timing when necessary. That's not to say that at the end of it all, their games do not still fall into the category of having your character fight against the greater forces in seemingly impossible odds but it's the journeys to the end that are written on a more personal, real world level that are appealing and feel refreshing for a JRPG. Upon my reflection on my experiences with Atlus and Square in recent memory; it could often feel as though Atlus when into a completely opposite direction of a 'typical' Square game in their Final Fantasy series. That's generally true but there were a couple of games I played in the last generation that show that that's not always the case. As previously stated, I had quite the fun with some of the DS and PSP games Square gave me. There was one game in particular that crossed my mind for that feeling of familiarity to a Persona game or even Devil Survivor - even if only partially superficially in that the setting for the game was a take on modern Japan - and that was Square Enix's 2007 action role-playing game, The World Ends With You. But why did that game receive the praise it did? There are countless reasons but one of them for me, was that it brought a similar morals and faith-in-humanity story into the modern world with 'ordinary' teenage kids as its players. While I certainly look to Square for a different type of JRPG experience for the most part, The World Ends With You felt a welcome change from the company at that time. There's no snoozing on Atlus when it comes to a traditional, fantasy story as well; and for me, this can be seen in Radiant Historia. With its time travel mechanics, the tale was centered around alternate realities based heavily on the choices as decided by its main character. The choices were mostly the kind that never felt that either of your options was particularly wrong in any given situation. Indeed, each world had its own positive or negative consequences as a result of your decision making but each choice led you to believe that you were doing what was best for that given scenario. The world was set in a traditional, grand narrative of the hardships and hard choices to be made in war - a timeless theme and a pliable one. And thus for now, Atlus seems to be capable of doing it all. Finally and worth mentioning because it's one aspect for me that just cannot be overlooked, is that of the music. Musically, what Shoji Meguro did for Persona 3 and 4 is in keeping with the modern themes and being relevant to topics of current cultural interest. The music reflects edgy styles, while maintaining urgency and an air of mystery when necessary. The music is clever, fitting and does not have to be a sweeping epic piece to reflect a grand journey. The journeys for personal growth are down to earth; and the music can feel very much a soundtrack for everyday life. For Catherine, some of the tracks layered classical pieces with modern instruments and beats. I often lovingly referred to those tracks as a “bastardization” of classical music. Truthfully, they're crafted to just be nothing short of amazing and inspired. Some Persona tracks do this quite well too - taking angelic chorus lines that become infused like its demons with heavy guitar riffs or drum beats of alternative rock. In looking forward to the next generation of console gaming, I will be following to see what Atlus and Square will bring. Perhaps neither of these two companies will impress me but with a strong showing from Atlus in the last (and a strong one thus far on the 3DS and the Vita in Persona 4: The Golden - a remake, I know! ), I hope to continue to fill my library with their games as I would the demons in my compendiums. I took some artistic liberties with the header image there. And by that I mean I butchered the thing. Don't judge me! 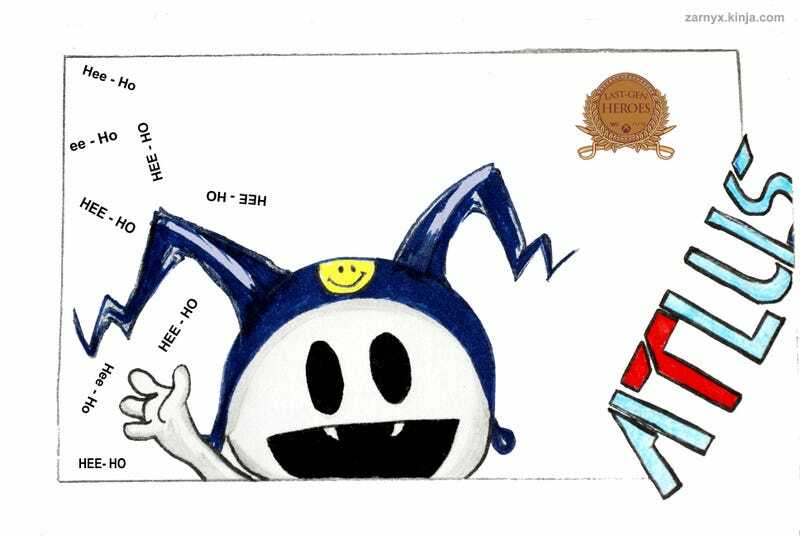 Hee-Ho on over to TAY Classic where discussions on life, video games and whatever you desire continue 24/7. If you had any questions on how TAY works, please give the TAYtorial a read.